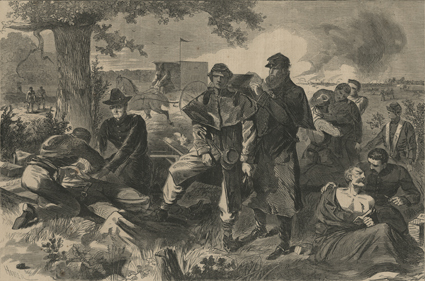 The Civil War Surgeon at Work in the Field, Winslow Homer, 12 July 1862 (National Library of Medicine, public domain). So said the narrator in Ric Burns’ moving Death and the Civil War. That was an understatement by the scriptwriters of Burns’ documentary but, in fairness, no words can ever adequately describe how terrible it was to be a wounded soldier during the first two years of America’s darkest time. By the mid-19th century, the nation’s technological advances had outpaced the improvements which physicians had steadily made to American diagnostic and treatment protocols. Despite the Herculean efforts of the fewer than 100 physicians initially available to tend to the wounded and dying, indescribable suffering and untimely deaths were the rule rather than the exception in 1861 and 1862. Before the war was brought to a close, roughly 620,000 men would be claimed by combat and disease, and more than $47 million would be spent caring for the wounded or those who fell ill. 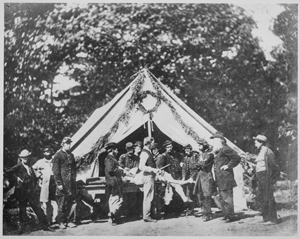 According to Burns’ documentary, America had yet to develop an effective ambulance corps or network of national hospitals, no provisions had been established for identifying soldiers or notifying next of kin and embalming was rarely used, making it difficult if not impossible to return the remains of loved ones to their native soil. And interments on site where men fell were also problematic because America had not, as yet, created its nationwide network of national cemeteries. As a result, bodies hastily buried were not always well marked, graves were disturbed on a surprisingly regular basis and, shockingly, unscrupulous grave robbers sold or made souvenirs of soldiers’ bones. An Indiana cavalry physician, says Sharp, reported that the prevalence of disease among his men was largely due to “poor hygiene practices such as failure to clean their quarters and change their underclothes.” A lack of fuel during cold weather and indigestion from strong coffee and greasy foods also compounded these problems. As a result, “Nutrition became an important part of treatment,” and quinine – “considered a wonder drug because of its dramatic effect when prescribed for fever, rheumatism, diarrhea, and venereal disease” became a popular tool of military physicians, says Sharp. Ammonia salts, calomel/mercurious chloride (used as a purgative or to kill bacteria and sexually transmitted diseases until the dangers of mercury poisoning were better understood), cathartics and laxatives, Dover’s Powder (a mixture of ipecacuanha and opium used to treat colds and fever), iodide of potassium and other expectorants, and milk punch also became common components of physician armamentaria. Each regiment typically carried with it a three-month stock of medicines and other medical equipment. Ambulance train, Union 2nd Army Corps, 1st Division, 1861 (U.S. Library of Congress, public domain). With respect to soldiers who were wounded in combat, says Sharp, many required surgical intervention in order to save limbs and lives. Following each engagement, wounded soldiers were removed from battle scenes and taken to field hospitals. Immediate transports from the field were performed via hospital wagons. Initially, these were manned by staff of the Quartermaster’s roster or other personnel who had little to no medical training. Drunkenness among these untrained members of the ambulance corps was not uncommon during the earliest years of the war. 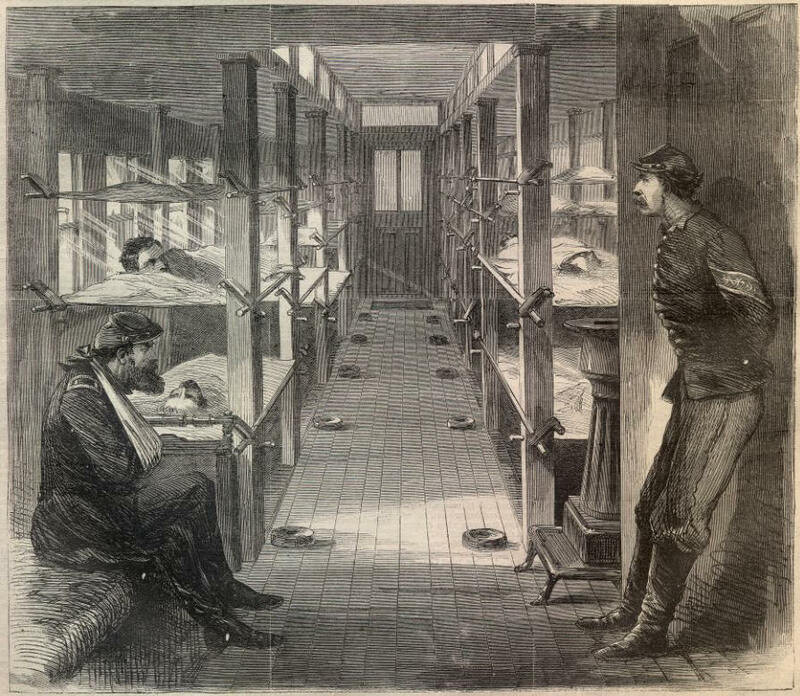 Hospital train interior, Harper’s Weekly, 24 February 1864 (public domain). When a regimental physician realized that more advanced care was needed for a more seriously wounded man, the physician would then order that soldier to be moved to a military general hospital by rail car or ship. 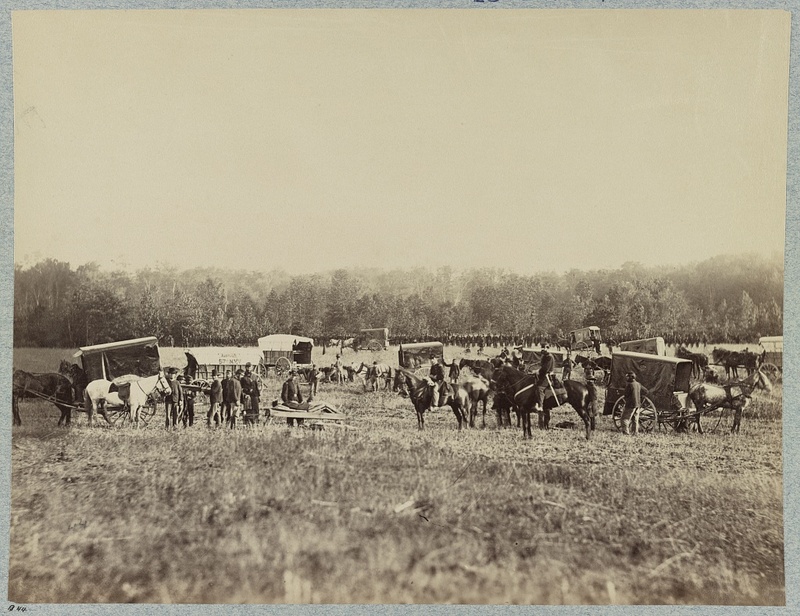 Such larger and better staffed hospitals were strategically located in towns behind the Union or Confederate lines; the transports were marked with hospital designations to protect them from enemy fire. As the war dragged on, the end doors of hospital trains were widened to process the growing number of those needing transport. According to Sharp, boxcars could comfortably accommodate nine patients, but were often packed with as many as 20; up to 32 stretchers could be suspended in passenger cars with stoves located mid-car to keep the wounded warm. Roper Union Army Hospital, Charleston, South Carolina, 1865 (Library of Congress, public domain). When necessary, churches, schools, local businesses, and even individual family homes were commandeered to serve as makeshift hospitals. Trains and ships were also used to move the wounded even further away – to major cities. There, soldiers could receive the most advanced care and/or convalesce long term. For Union soldiers fighting on the East Coast, including the 47th Pennsylvania Volunteers, this meant trips to Baltimore, Philadelphia, New York City, or Washington, D.C. While stationed in the Deep South, the 47th Pennsylvania’s wounded were also cared for at hospitals in Beaufort, Charleston (Roper) and Hilton Head, South Carolina; Forts Taylor or Jefferson in Key West and the Dry Tortugas, Florida; New Orleans, Louisiana; and Natchez, Mississippi. The most frequent type of battle wound which appears in military records of the period was Vulnus Sclopet – the Latin term for a gunshot wound – and was inflicted both by the enemy and via “friendly fire” (accidental shootings by one member of the regiment by another or of someone on the same side as the shooter). In one infamous incident with the 47th Pennsylvania Volunteers, Sergeant Charles Nolf was out enjoying an afternoon of shell collecting on a beach in Key West, Florida when he was cut down by a New York soldier who had been playing with a loaded rifle. Bullet wound infection, Surgical Memoirs of the War of the Rebellion, Vol. 1, 1870 (public domain). Wounds for the 47th Pennsylvanians ranged from “through and throughs” – gunshot injuries in which minie balls or other projectiles entered and then passed through their bodies – to the sheering off of limbs or shattering of bones so badly that amputations were the only possible recourses. For other unfortunate members of the regiment, minie balls pierced heads and pinged around before lodging elsewhere inside bodies. Astoundingly, several members of the 47th Pennsylvania who sustained head shots actually survived and went on to live long after war’s end, including William Wallace Geety. Amputation performed in front of tent, Gettsyburg, 1863 (Library of Congress, public domain). As the war progressed, resection became a more accepted form of treatment. 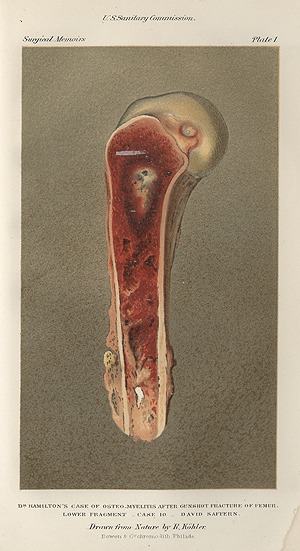 By removing only the injured area, a soldier was more likely to survive surgery, but was also often left with a non-functional or poorly functioning limb. By war’s end, says Kluskens, roughly 60,000 soldiers in total from both sides had undergone amputation. As a result, there was a surge nationwide in the use of prosthetic devices. By the 1870s, more than 150 patents had been issued for improved prosthetics, which were generally covered by soldiers’ pensions (as were the costs of transportation for veterans to travel to prosthetic limb manufacturers for fittings). 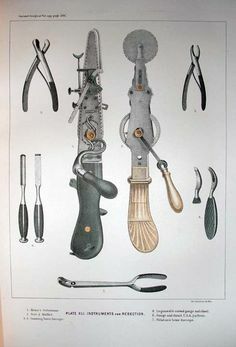 Civil War-era surgical devices, c. 1861-1865. (Source: U.S. Surgeon General’s Office, public domain). The methods of treatment were almost as diverse as the types of injury. In addition to amputations or resections, these included, blood-letting, ligations, plastic surgery, tracheotomies, trephination (drilling burr holes into the skull to relieve pressure on the brain), and surgical extractions to remove minie balls and/or shrapnel from cannon shells and other foreign objects (buttons, bits of clothing, wire, etc.). Medicines employed included alcohol, laudanum, morphia, and opium. Chloroform was the anesthesia of choice for surgical cases, says Sharp, because it was more effective than ether. So widespread was the use of chloroform, in fact, that military records confirm the anesthetization of no fewer than 80,000 wounded soldiers with chloroform. At times, a combination of chloroform and ether was employed as a painkilling sedative. By 1862, the medical situation for Union forces had become so dire that U.S. Surgeon General William Hammond pressed the War Department to transfer control of what little ambulance services there were from the Quartermaster’s office to that of the medical corps. He also took steps to radically alter the care environment for soldiers, appointing Jonathan Letterman as Medical Director of the Union’s Army of the Potomac. Letterman improved military medical procedures by “giving control of ambulances to the medical department,” and by “creating a standard medical supply wagon for each regiment and a standard medical bag for each physician,” observes Sharp. He also reorganized the structure of physician recruiting and promotion, ultimately ensuring that physician competency and not rank became the standard for selection and advancement, and reorganized the staffing of regimental, post and division (general) hospitals. From a treatment standpoint, Letterman’s actions ensured that field hospitals were in place for each division prior to any military engagement, that division hospital sites were chosen by medical directors and were each assigned one surgeon as a superintendent, one assistant surgeon who managed both supplies and the physical needs of those present, three medical officers who performed all of the surgical procedures, and three medical officers who assisted those surgeons (one of whom handled all of the anesthesia procedures). Additional medical personnel were then added as available. Letterman also directed that any soldier brought to a hospital would be treated regardless of his regiment. As part of this revamping of care, Letterman’s medical men also pioneered what would become known during the Korean War as “MASH” units (mobile army surgical hospitals) and “forward first aid” (the creation and and staffing by regimental surgeons of of “temporary medical stations in the rear of action” which served as “focal points of evacuation by ambulance” and where bleeding was stopped and soldiers’ medical conditions were stabilized enough to allow them to be transported elsewhere for advanced care). New procedures for triage (“preparing patients for surgery and organizing them in order of urgency”) were implemented and a system of battlefield-based, long-term recovery hospitals was added to enable the gradual convalescence or death with dignity of patients too severely injured to be moved. Despite these advancements, however, descendants of the men who fought during the Civil War still find it as challenging today as immediate families did in the 1860s to locate information which confirms what actually happened to individual soldiers. This, says Sharp, is because “medical staff did not always keep detailed records” about their patients or about the specific treatments being rendered to those patients. According to The Medical and Surgical History of the War of Rebellion, many of the wounded and dying were simply too incapacitated to provide information about who they were and what had happened to them. In addition, medical personnel were often so overwhelmed by the sheer number of casualties they were processing that they were unable to divert time from treatment to fill out paperwork. In other cases, records that were created were later lost – burned during battle, discarded out of ignorance or misplaced while troops were on the move. 1. Bates, Samuel P. History of Pennsylvania Volunteers, 1861-5, Vol. I. Harrisburg, Pennsylvania: B Singerly, State Printer, 1869. 2. Burns, Ric, et. al. Death and the Civil War (video), on American Experience. Boston and Washington, D.C.: WGBH and PBS, 2012. 3. Historical Registers of National Homes for Disabled Volunteer Soldiers (microfilm M1749), in Records of the U.S. Department of Veterans Affairs (Record Group 15). Washington, D.C.: U.S. National Archives and Records Administration, 1866-1938. 4. Hill, Corinna S. The Social Integration of Civil War Veterans with Hearing Loss: The Roles of Government and Media (An Honors Capstone Submitted in Partial Fulfillment of the Requirements for Graduation with University Honors). Washington, D.C.: The Honors Program, Gallaudet University, May 2014. 5. Otis, George A. Photographs of surgical cases and specimens / prepared by direction of the Surgeon General by George A. Otis. 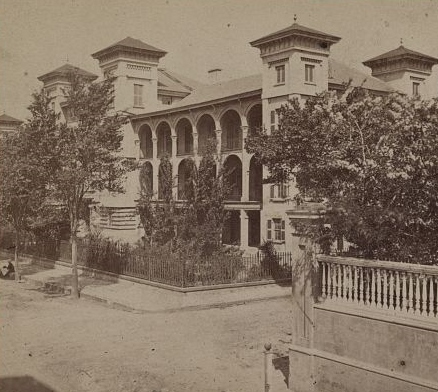 Washington, D.C.: Surgeon General’s Office, 1861-1865. 7. Roll of Honor (No. XIV): Names of Soldiers Who, in Defence [sic] of the American Union, Suffered Martyrdom in the Prison Pens throughout the South, in Quartermaster General’s Office, General Orders No. 7, February 20 1868. Washington, D.C: Government Printing Office, 1868. 9. Sharp, Rebecca. Medical and Surgical History of the War of the Rebellion (video). Washington, D.C., U.S. National Archives and Records Administration, 3 June 2015. 10. Smart, Charles and Joseph J. Barnes. The Medical and Surgical History of the War of the Rebellion. Washington, D.C.: Government Printing Office, 1870-1880. 11. U.S. Civil War Veterans’, Widows’ and Orphans’ Pension Files. Washington, D.C.: U.S. National Archives and Records Administration. 12. U.S. Veterans’ Schedule (1890). Washington, D.C.: U.S. National Archives and Records Admnistration. 13. Kluskens, Claire. Using Records of Artificial Limbs for Union Civil War Veterans, 1861-1927. Washington, D.C.: U.S. National Archives and Records Administration, 14 May 2015.